"Helping Make Your Dreams Come True"
DJ John Horne based in Kent and has been providing quality mobile disco services for over 20 years. My aim is simple and that is to give you the best party experience possible, bringing fun, laughter and a great time for you and your guests. Your vision along with my experience, will help make that happen. With my vast experience of all types of functions from children's parties to 18th, 21st, 40th ,50th and 60th birthday parties, anniversary's and wedding receptions - I know how to make a party rock! Using an online music request system, that enables you to choose songs in advance, that you would like to be played during your party. Not only do I work from your list but also take requests on the night as well. However if you have no music requests that isn't a problem either. The sound and lighting I use is designed to assist me to look after your needs, from a small quality compact disco to a large full on disco. It's your party and your choice. 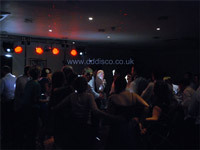 Not only do I provide mobile disco entertainment for your party but I also provide extras as well. Such as, a fun photo booth, starlit dance floor, up lighting and event photography with a fun photo slide show. All helping to provide that great party experience. For more information on the above details, please do get in contact. Required by many venues, Kent Party DJ has a current PLI policy with SEDA in the amount of £10 million. Also required by many venues, Kent Party DJ has not provided satisfactory evidence of having current PAT records available. A Method Statement, outlining Kent Party DJ&apos;s Health & Safety procedure for setting up disco equipment has not been supplied. Why do people choose to book Kent Party DJ? "John Horne was really really good. Friends and relatives at the party loved his choice of music, which was a wide range and they also loved the visuals and the videos as well. Would definitely recommend him. He was really good right from the first email we received from him." "We were absolutely delighted with Kent DJ. He was extremely informative, and very responsive when I asked questions. I loved the way he involved the girls from start to finish with their music choices, it made the lead up to their party so much more exciting. We were so happy with our choice, and we would definitely use Kent DJ again. Thanks for making the party a raving success." "John and Steve did a fantastic job. They were professional but friendly and approachable. John played the right music to suit the occasion. I would use them again and highly recommend them. [ADMIN: This feedback was earned under a different company identity DD Discotheque]"
"I was so pleased with John and did disco, he was very polite played everything I requested. The music was great, it wasn't too loud and every time I spoke to John or his assistant they were very helpful. They were on time and finished on time too. I would definitely recommend them to others and the party guests were very happy too. thank you John. [ADMIN: This feedback was earned under a different company identity DD Discotheque]"
" would highly recommend John and Stephen. John played all the music requested on the playlist and kept the party going. Excellent value for money. [ADMIN: This feedback was earned under a different company identity DD Discotheque]"
"Dj was really good will be hiring him again [ADMIN: This feedback was earned under a different company identity DD Discotheque]"
"Thank you, it was a great night, always a pleasure with guests that know how to party." "John and Steve were extreamly pleasent professional and so friendly! They communicated with me prior to the event and during the event to see if I was happy which I was! All the guests commented on how good the djs were! The music was a fab sollection and if I need a DJ again I will Most definatley be choosing these guys! Thank you so much for your hard work! You made my fundraising night for my brother even better then I could imagine! X [ADMIN: This feedback was earned under a different company identity DD Discotheque]"
"Amy had a great birthday party, many thanks John. [ADMIN: This feedback was earned under a different company identity DD Discotheque]"
If you are contacting Kent Party DJ about an event, it's always a good idea to include the DATE, LOCATION, EVENT TYPE, AGE GROUP and TIMINGS to speed things up!